This week we connected pipework carrying foul/waste water to the sewer system, involving getting dirty in mud again. Inside, I focussed on the other end of the pipework, finalising my selection of sanitary ware. Drainage and sewers can often be repulsive topics, not just for the obvious reasons but because as anyone in construction will tell you, any time you have to go underground adds extra risk and often, cost. In this case, things weren’t too tricky as the route we had to take had not previously been developed and we do not need to excavate too deep. Much of the week had been taken up planning for the connection which would happen next week. However, the day before I was leaving for a short trip to see the Guggenheim in Bilbao, one of my favourite buildings with its inspiring big white walls, angles and expanses of glass, the contractor surprised me by starting on the connection, hoping I was already gone! 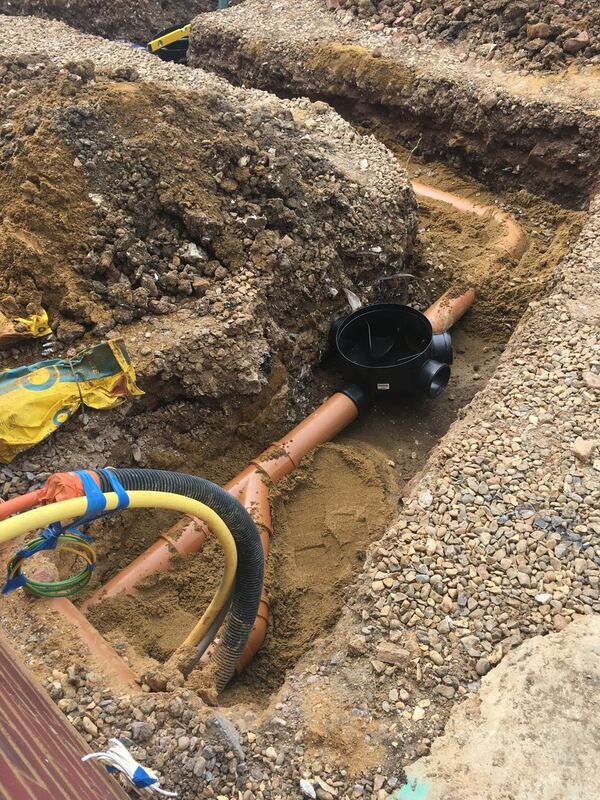 The 3 individual main drainage pipes from each property will then connect into a single pipe outside and then into the main sewer. At intervals, inspection chambers must be provided, allowing access to pipes in case of blockages or other problems – these are the black boxes you can see. 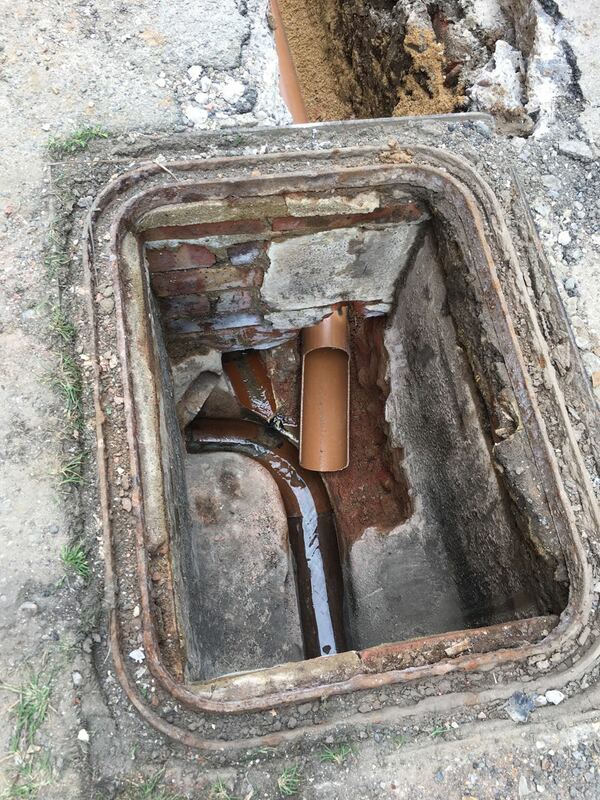 Connecting to the drains can either be ‘direct’ or ‘indirect’ – the former being directly into the public sewer (usually on public land) or into a privately owned sewer which feeds into the main public sewer. 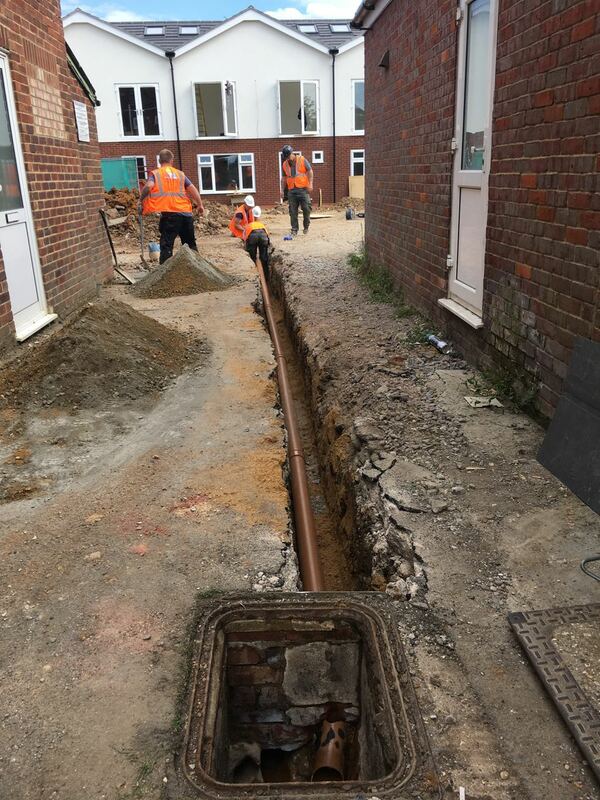 Luckily for us, there was a private sewer by the back of the existing buildings, so we only had to run pipework for approx. 25m, rather than 50m to the main road. A shallow gradient of at least 1:40 (approx. 1.5%) needs to be factored into the design to let gravity carry the waste away. This gradient often sets the minimum height of the ground floor relative to nearby sewers, however if the gradient cannot be achieved, a pump like this can be used instead. At the other end of the pipework are of course the toilets, sinks, etc. Back at my desk I was researching which sanitary ware I wanted to go for. When preparing the tender I was advised by some to specify prime sums within the contract – these are £ allowances for fittings and fixtures, to make sure all costs are captured. Instead I chose to specify specific products I would like, thinking each contractor can obtain these at different prices, so they can also compete on material prices. The issue here however is that if changing your mind on these items, may need to agree additions or deductions in the contract sum. As you may remember from week 16, both the contractor and I were operating on a sort of ‘significant variations only’ basis, so any small changes in cost cancel themselves out, hoping to foster some level of partnership and goodwill. When specifying the items, I also stated ‘…or similar approved’, meaning alternative products can be used if they perform to the same standard and meet my requirements. This was in fact the case with the boiler, with the contractor sourcing a cheaper, yet equally performing model from what I had asked for. And regarding my actual choices, you’ll see these in the following weeks once they are installed! 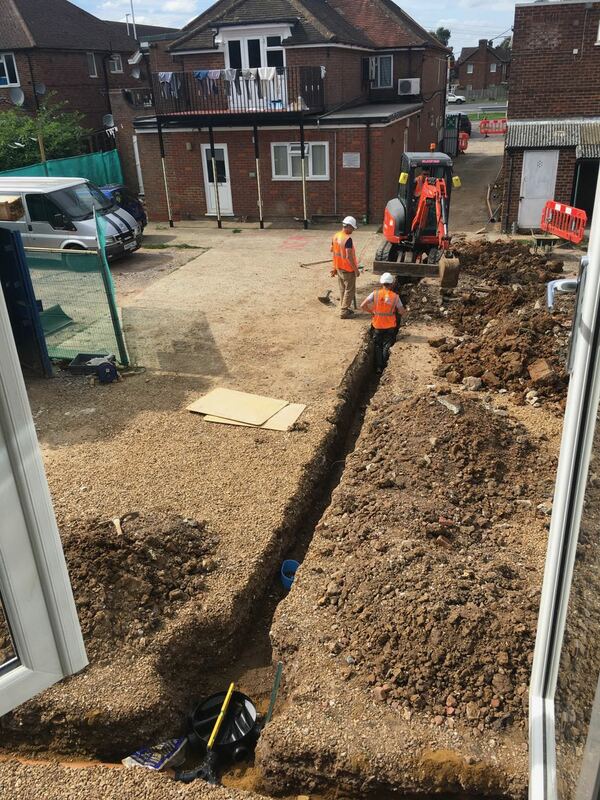 Next week is one of the biggest single phases of works since the roof steels went in during week 11, when we start laying connections for the utilities, including hooking up to the gas mains. Copyright © 2019 Building Blox. All Rights Reserved.